A church for the church! Although making up summer containers at this stage in summer isn’t keeping me busy, I had the priviledge to do a presentation for the Goodwood United Church Victorian Tea. The ladies of the church asked me to make up a container for outside the church and do a show and tell at the same time. Not being much of a shrinking violet, I jumped at the chance to promote Lou’s Blooms to 72 ladies, who were dressed in their Sunday best. Most with Hats, feathers, fascinators and finery. Unfortunately, I don’t have photos of the Ladies, but I’m sure I shall receive a few pics of the afternoon, from a camera yeilding Victorian lady…Ann…Goodwoods answer to David Bailey!…Who wasn’t so much Victorian, talking about photoshopping people into the picture and asking people to say “cheese”…well I’m not sure. Maybe they did say Cheese in those days?? Anyway. The container is in it’s resting place and it won’t be moved for a while as we had to recruit some muscle men and a hefty strap to lift it from the church “Tea room” to the front door…it weighs a ton!! I am told it was rescued from a garbage can somewhere. What a fine specimen it is. Love planting in huge containers, you can do soooo much more when you have a lot of space. I am space challenged, as when it’s time to plant a small container, it’s a much longer thought process!! Hopefully you can see the little replica church in the container. My Mum, always an artist, has been painting little birdhouses for me this year. They are sooo pretty and everyone…even though I’ve made up the container…makes sooo much more fuss about the Birdhouses!!! But they are really cute. Thanks for stopping by. 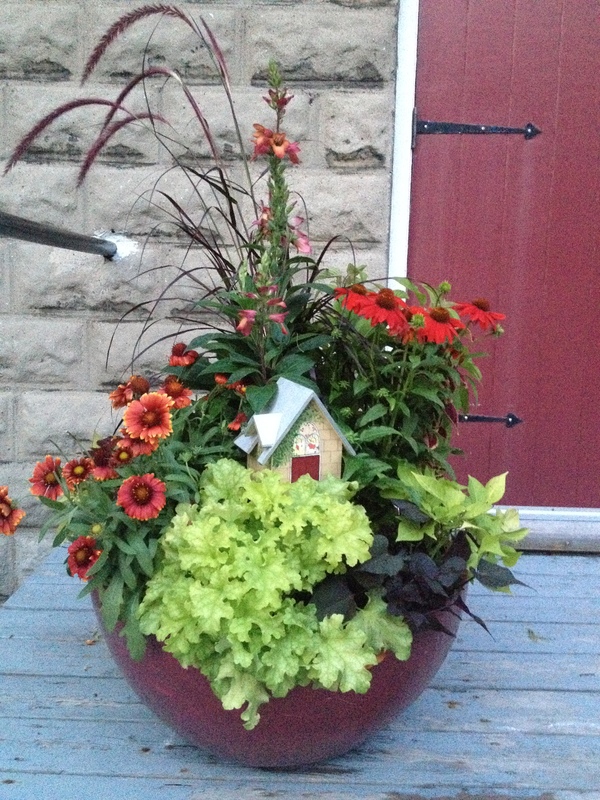 Don’t forget to check out my Summer Container page. See what’s new.